The walk starts at the picnic pavilion behind the nature house. Take the wide stone dust trail going northeast from the picnic pavilion. The trail crosses a gully on a wood bridge. Turn left to follow a mulched trail on the other side of the bridge. The trail passes a park bench on the right. After going down hill turn right at the trail intersection. After a short distance turn right at the next trail intersection. Pass a display on rocks common to this area. The trail intersects with a wide asphalt trail. Connect on the asphalt trail in the same direction as the previous trail. After a short distance turn left onto the wide asphalt trail over a bridge. The bridge crosses Snakeden Branch and Lake Audubon is on your right. Turn left onto the wide asphalt trail at the next trail intersection. This trail follows Snakeden Branch upstream and homes should be on the right of the trail. Just after the trail crosses a bridge a wide asphalt trail branches to the right. Continue straight on the present trail. A wide asphalt trail intersects from the right. Continue on the present trail. A wide asphalt trail branches to the right next to a trash container. Stay on the trail to the left. The trail climbs a small hill behind a store. It then turns left prior to Soapstone Drive and crosses Snakeden Branch. Turn right at the wide asphalt trail through the tunnel under Soapstone Drive. Turn left at the next wide asphalt trail and proceed up the hill with houses on your right. The trail reaches the parking lot for the Glade Recreation Area. Continue straight on the trail to the street. Turn right and follow the wide asphalt trail across the entrance to the parking lot. At the tennis court turn left onto the wide asphalt trail and cross Glade Drive. The trail on the other side goes down the hill with a gully and homes on the left. A wide asphalt trail intersects from the right at the bottom of the hill. Continue straight on the present trail. After crossing the bridge turn left onto the wide asphalt trail. After crossing Soapstone Drive continue straight on the wide asphalt trail passing a wide asphalt trail to the right. After a short distance turn left at the natural surface trail next to the Wildflower Trail sign. Either trail may be used as they both meet in a short distance. After reaching Glade Creek take the natural surface trail to the right. The trail follows the creek at a short distance. After a short distance turn left to cross a bridge over the creek. At the next intersecting natural surface trail turn right and follow the trail over a small hill. Turn left at the next natural surface trail and follow the trail up the hill. The trail passes the Pine Branch Trail. Continue on the present trail up the hill. At the next natural surface trail turn right to follow that trail across a gully. The trail reaches Glade Drive. 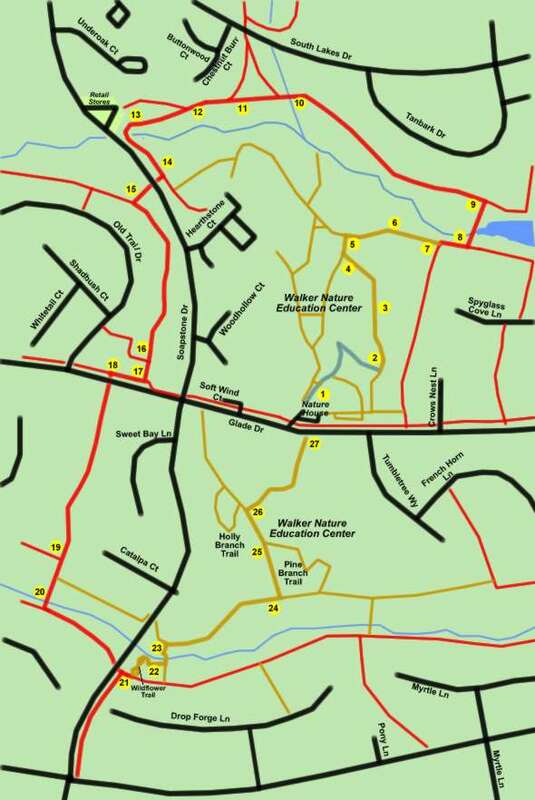 The nature house and the start of the trail are on the other side of the street from your present location.